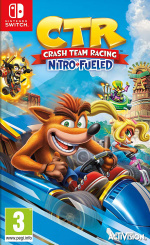 Following the success of Crash Bandicoot N. Sane Trilogy, publisher Activision has revealed Crash Team Racing Nitro-Fueled will be released on multiple platforms, including the Nintendo Switch, on 21st June 2019. The title is a remake of the original 1999 PlayStation game that was developed by Naughty Dog. It will be handled by Beenox and will include all of the original game modes, characters, tracks, power-ups and weapons. There'll also be additional karts and tracks from beyond the original release, and players will also be able to race online with friends and take on the competition in online leaderboards. Take a look at the official trailer above and tell us in the comments if you're excited to head out onto the track with Crash. Oh so there's no wait unlike the Trilogy? I didn't see the Switch logo. I thought it was just for the PS4. This is another solid 3rd party addition to the 2019 lineup! Between awesome first party games and awesome third party multiplats like this, I think that 2019 will be the best year for Switch! Nice to see Crash continuing. Your days are numbered Mustache Man... Plumber Boy! Somehow, no one has ever been been able to copy Mario Kart properly... maybe if the developers have been playing a LOT of MK8 over the last several years, they will get this right. I will probably just wait for MK9... or maybe Mario Kart Ultimate... Every Track is Here! The Bandicoot is truly back. In an unrelated note, congrats to that band that's currently on the stage. They seem to have made a song about the devil worse than 90% of Christian rock ... and that's a hard thing to do. Would like to see a new Crash in the tradition of the original trilogy. @DavidMac hahah that was awful. Yah win some yah lose some. yes! I loved this game. So this was why Nintendo tells us to tune in?? Don’t tell me this is the big announcement . Wow. I knew it would be some bs. 2018 was definitely an improvement over 2017, but we can still do better. And 2019 will be the proof in the pudding. By 2019, The system will have been out for two years with rocksolid success. So most of those developers who started making games a year after the system launch when they saw it was legit, those games will start releasing in 2019, 2020 and 2021, depending on the development cycle. system. Even Boobysoft didn’t have an exclusive ready for launch like they usually do. Practically every third-party developer out their had lost faith, so Nintendo had to build up their support block by block, game by game, all the while ensuring the system stayed selling like hotcakes despite not having most third party games. That’s quite the challenge. Yet they’ve done it. Had the system slowed down significantly at any point, those developers would’ve gotten cold feet and Nintendo would’ve potential lost third-party support forever, or at least the foreseeable future. I don’t know if they would’ve ever recovered from that. I’m glad that’s not how things have turned out. They’ve done the impossible with a chicken or the egg scenario working against them. You need games to sell systems, but the developers didn’t want to put those games on the system until they saw it selling long term. Kudos to them for pulling that one off. Yes! I panicked when I didn't see the Switch logo in the reveal. But it shows in the youtube trailer. At worst, this looks like a MK8 clone with Crash Bandicoot characters, levels, and power-ups. So I can't wait, because that sounds awesome. Now, if the Team Sonic racing devs can get their stuff together, I might have three solid kart racers on a single console. My nephew is going to love this. Can't wait to play this again. I'm more excited for this than Team Sonic Racing. Hmm. If this turns out as good as people made the original out to be, I guess I'll be able to see what the fuss is all about at long last. The trailer made it look like it was a PS4 exclusive. Glad to see that it is coming to the Switch. 60 FPS or else same to you Sonic racing, if you guys are gonna take aim at the king MK8D you better not miss with half assed performance and inferior controls. Great news. Now how about Muppet Racemania? Anyone remember that from PS1? That was awesome. @Regpuppy This is a remake (with new tracks and karts) so I can tell you it's far closer to Diddy Kong Racing than Mario Kart, with an open world between tracks and challenges and such. @link3710 Note, I said "at worst" and didnt mean that's necessarily what I expected. They did really well with the N-sane trilogy and Spyro trilogy remakes, so I have really high hopes for this game. This got me so hype. CTR has always been my favorite kart racing game, hands down. Had the best single player for any game of this kind. Nah... Between Mario and Sonic, I'm good for Kart racers. @Kevember The depressing thing is that two heavy hitters would be missing from any new Diddy Kong Racing game. Both Banjo, and my DKR main, Conker, are with Microsoft now. Add to this that Diddy and DK have already been integrated, and I feel like we're better off asking for a new Mario Kart, or a Mario Kart spinoff with more Nintendo ips involved. @link3710 I enjoyed DKR on the 64, so I'll probably get this.. since it has an adventure mode. I'm sorry but Mario kart 8s controls were too slow, sluggish and tank-like when making a turn. This when never the case for super Mario kart and super circuit. Hopefully this game doesn't have the same issue, never played the PS1 original, just the crash trilogy. I'll probably get this, because I adored the original, but after the N.Sane Trilogy I'm kinda worried how it'll play. They straight-up botched the feel of Crash in those games. Very excited. I’ll be getting this. YES!!! This was one of my favorite games to play when I visited people with Playstations growing up! I’m psyched!!! @Regpuppy I remember buying Diddy Kong Racing DS and spending the longest time trying to unlock Banjo only to find he wasn't even in the game; I was extremely disappointed. Nintendo Kart sounds like a great idea although I believe they'll keep the Mario Kart name and just keep adding more Nintendo characters. Loved the original ~back in the day~ and this looks phenomenal, just like the trilogy remaster. I’m getting this. Now I actually have an excuse for not buying MK8DX! @hadrian Was this statement supposed to be contradictory? It’s up there with Mario Kart as the greatest racer ever, I played for hours 4 player split-screen with my mates. Such an amazing game, fantastic news! I’ll be double dipping; a Switch and PS4 version so I can play again with those same mates online after all these years (they live in foreign lands now). Finally. The best Kart Game from that Era. Why would Sony demand for the trailer to be shown as a PS ad? Only the youtube video has it with xbox and Nintendo logos (switch being front and center btw). Did Sony pay handsomely for this maybe? They aren't even publishing it and usually ads are in the interest of the publisher which is Activision. Activision would prefer its product to be shown for a wide variety of platforms given they've invested on each. This is weird/interesting. Sorry for double posting but, for the ones talking about MK8 and Sonic, remember that this one goes more in line to what Diddy Kong racing did: a long and nicely done story mode with bosses and everything. CTR was my first video game, and I still have my original copy... I’m hyped to see the remake! @Sac_instead Did you see the big announcement? @ChompyMage yes I was wrong sorry Nintendo . 20 years later, still the greatest kart racer made. It's a much better game than Mario Kart games IMO . Less frustrating and less unjust. and has a story mode! To anyone who never played the original. It’s amazingly good. Right up there with the very best Mario Kart games. I probably won’t be buying it though, I still have the original and I always seem to find remakes a bit disappointing. From the mouth of Thomas Wilson ( The Creative Director and Co Director of the studio), CRT Nitro Fueled will be available at 39.99€. @SalvorHardin - Yep, better be 60fps. I'm definitely interested in this one. I'm starting to doubt if Sonic Racing will be good after that delay. I don't give a crap about Crash Bandicoot, but if it's a great Mario Kart clone, then I'll buy it. So, to give Mario Kart real competition, they need to remake a game from the 90s. It better runs in 1080p/60fps up to 2-player-mode like Mario Kart 8 Deluxe. Gonna get it day one and play the hell out of it on my vacation next July! I might have to buy it if Activision finally does something good. @BlackenedHalo Well most 3D games from that era have not aged well, including MK64 really. Anyway I’m just glad someone else has played Muppet Racemania. It never gets a mention on any kart racing list which is a shame. I think this game will sell well after the Crash Trilogy. After looking at the trailer it didn't show much gameplay but am worried it did look a tad slow. Looking forward to online multiplayer though. The original was a really fun game, just hope there's not too much in the way of having to jump all the time for the time trial mode to collect the time stopping boxes - it made the game quite frustrating in later levels. It´s going to lose against Mario Kart 8 on Switch, if it doesn´t perform the same way. And if Activison mucks about the game like with Spyro, then it happens anyway. Yes please! The only issue here is how popular mario kart is. That fact you got downvoted makes me lose faith in people wanted a great gaming experience on a machine that does 60fps MK8 in portable for a game in the same genre. If the Switch version turns out to be a turd, I'll just have to wait for the eventual PC release. Also, I feel very sorry for anyone that missed out on CTR back in 1999 as it was better than any kart racer on the N64. I think they just don’t understand it but if they played MK8 capped down to 30fps they instantly would. @Prizm it being delayed can mean it’s a mess or that Sega was willing not to rush it out for q4 and give it the time it needs, either way it’s looking meh and a step down from Sumo’s previous efforts. I never really played this one but I do have Crash Nitro Kart on the Gamecube and I love it. That said, this 'Day One' nonsense needs to stop. Pay attention, the game industry is hitting new levels of anti-consumer behavior and stuff like pre-ordering and creating hype is a large part of the problem. This looks much worse than MK8 tbh, a bit like a cheap mobile game that the eShop is littered with. I'm sure it will be a lot better though, but bit strange to try next to MK8 in the game, depending on its price point. This is very welcome, the original was terrific. Better than MK64 (or Double Dash come to think of it). Hopefully the new version is handled well. Cool! I have very vague memories of playing this game with my sister. Good stuff. Never played the original, but I'm always down for a good kart racer. Nice to have some variety in kart racers. I love Mario Kart as much as the next guy, but I’ve been hoping to play this game for a while. Great news! Oh, this may sell like hotcakes.